It is one of the most charming neighborhoods in Mount Pleasant. Tucked away inside Belle Hall Plantation, Hibben is a delightful blend of houses built in the Charleston style set along sidewalks that invite you to go for a relaxing stroll or a long, invigorating run. Picket fences are a common sight, and there are bits of green space sprinkled throughout, including a playground for children lucky enough to live here. 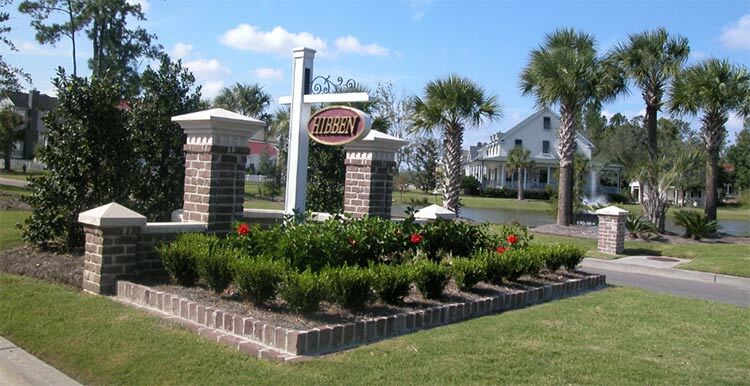 Hibben is one of the most desirable communities in Mount Pleasant. The homes & setting are reminiscent of downtown Charleston, with charming architecture, sidewalks and trees. The land itself is steeped with Lowcountry history. An 837-acre tract known as Egypt Plantation in the 1700s, it changed hands three times before the Hibben family took ownership in 1775. A working plantation, it remained in the family until 1906. The neighborhood of Hibben now occupies the area where the fields were located many years ago. Nevertheless, there are plenty of trees to provide shade, as well as ponds and marsh views. With homes ranging in size from a little under 2,000 square feet to more than 5,000 square feet, there is truly an option for every family. Inside, the houses are beautifully appointed with large, open spaces and spacious kitchens built for entertaining or just for family dinners. Master bedroom suites are havens laid out with luxury in mind. But, according to Rob and Cara Daniel, who recently moved to Columbia, the best part of life at Hibben is the camaraderie of the neighbors. “All the houses are set up for entertaining,” Rob Daniel said. “Everyone gets along and we became pretty close with the neighbors. Our house had a real open floor plan, and my wife would host a lot of things … book club meetings, bridal showers.” A young family with small children, the Daniels enjoyed the pool and tennis courts but found almost more pleasure in the natural surroundings.